Popular Celebrity stylist, Jeremiah Ogbodo aka Swanky Jerry of Swanky Signatures attended Afro Republik on Saturday night. He has come to the defence of Tiwa Savage, whom many have attacked over her choice of outfit to the event. 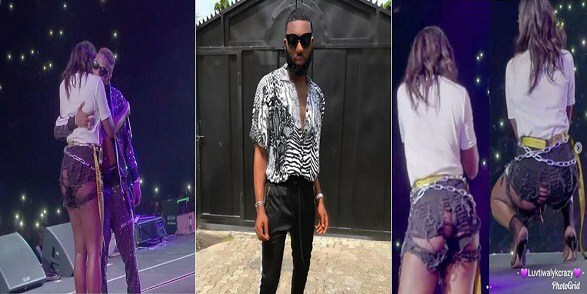 Tiwa Savage wore a ripped grey bum-short which showed off her butts, and of course, it got people talking. Swanky has now taken to Instagram to slam trolls, saying he wished Tiwa and #Wizkid kissed last night for pepper them sake. ““It’s funny how people who have achieved little or nothing in life will want to criticize those who are putting the country on the map. “Your unconstructive criticism doesn’t count. Let people live! Wiz and Tiwa had the most amazing performance last night and I can’t help but give them all the accolades. They deserve it. “Instead of you trolls to focus on the good of last night, you want to focus on what she was wearing? “Give it a rest. If she wore Ankara you all will still criticize her. I legit wish Wizkid and Tiwa kissed for pepper them sake after their performance even though they are friends so you all can have a complete meltdown.